SFA music faculty members, from left, Evgeni Raychev, Jennifer Dalmas, Linda Parr and Andrew Parr will perform a concert that will benefit the Baumgartner Memorial Award at 3 p.m. Saturday, Feb. 24, at the Old University Building. NACOGDOCHES, Texas - Four music faculty members at Stephen F. Austin State University will lend their talents to a fundraising concert that will benefit a voice scholarship. 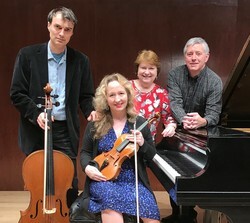 The concert, "Beethoven and Bonn-Bons," will be at 3 p.m. Saturday, Feb. 24, at the Old University Building and will feature Jennifer Dalmas, violinist; Evgeni Raychev, cellist; and Andrew and Linda Parr, pianists. The event is sponsored by the Nacogdoches Symphony Club, and proceeds from ticket sales will go toward funding this year's Baumgartner Memorial Award, which is given each year to an SFA student voice major. The program features two of Ludwig von Beethoven's most famous and beloved piano trios - the "Ghost" and "Archduke." A reception will follow the concert, and the Symphony Club will provide chocolate treats and coffee. The Old University is located at 515 N. Mound St. in Washington Square. Tickets are $20 with limited seating. For tickets or more information, contact Thelma Dalmas at jtdalmas@juno.com or (936) 205-5283.